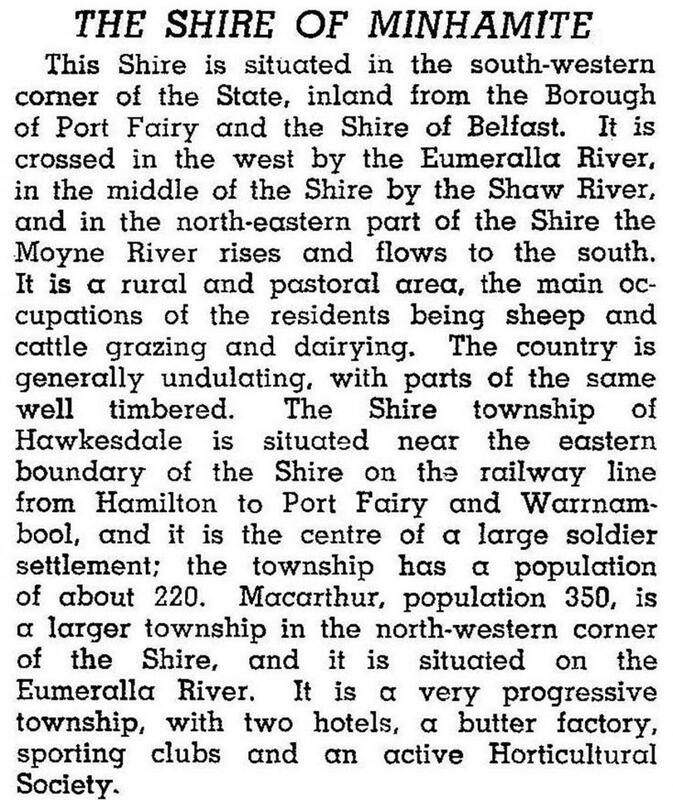 Minhamite shire (1871-1994) was in western Victoria, immediately north of Belfast shire which was contiguous to Port Fairy. The shire was entirely rural, with two small townships which between them had seven shops in 1992. The townships were Macarthur and Hawkesdale (the administrative centre of the shire). Macarthur was the larger of the two. The shire’s pastoral runs were taken up in 1842-44. Settlement by small land-holders tended to be around the tracks from Port Fairy to Hamilton and Penshurst. The Hamilton track, on which Macarthur is located, was near Mount Eccles which deposited fertile volcanic soil suitable for agriculture and dairying. When Minhamite shire was formed on 13 January 1871 by severance from Belfast shire, Macarthur was positioned near its western boundary. Hawkesdale was more centrally positioned and seemed to be the natural place for the shire’s offices. The idea was contested – probably resulting in the compromise name of Minhamite – and the shire’s offices were at first somewhere between the two towns. (Minhamite is a small village at the north of the former shire and the name is thought to have been an Aboriginal one for a lake or swamp to the south.) Hawkesdale finally secured the shire offices in 1908. Several of the shire’s pastoral estates were subdivided for closer settlement shortly before World War I, and soldier settlement occurred after both world wars. The Hawkesdale district underwent most soldier settlement during the 1950s, and the shire’s population peak coincided with the opening of the Hawkesdale high school in 1962. The Eumeralla River flows through the west of the shire and much of its stream area has been flood-prone. Swampy land was first drained in the 1890s, and severe flooding in 1942 resulted in further drainage works in the 1950s. Despite that work and the soldier settlement, the shire’s population declined by 40% during 1961-91 as unprofitable grazing properties were amalgamated. In 1994 farming occupied 81% of the shire’s area of 1366 sq km. Grazing was the main activity, with 486,000 sheep and lambs, 43,200 meat cattle and 8090 dairy cattle. On 23 September 1994, Minhamite shire was united with Belfast shire, Port Fairy borough, most of Mortlake and Warrnambool shires and part of Dundas and Mount Rouse shires to form Moyne shire.